Timothy P. Rohrig, PhD, is currently the Director of the Sedgwick County Regional Forensic Science Center. He also holds the positions of Director of the Forensic Science Laboratories and Chief Toxicologist at the Center. Dr. Rohrig is part of the graduate faculty of Emporia State University (Kansas) and Adjunct Professor of Criminal Justice and Forensic Science at Wichita State University. He is also currently Visiting Professor of Forensic Toxicology at the University of Lincoln, in the United Kingdom. Dr. Rohrig is a Fellow of the American Academy of Forensic Sciences and the past Chairman and Secretary of the Toxicology Section and past President of the Society of Forensic Toxicologists (SOFT). In 2009, he was honored to receive the Rolla N. Harger Award for outstanding contributions to the field of Forensic Toxicology. 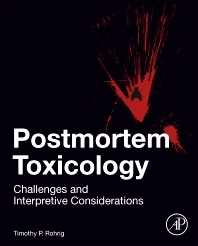 His current research interests include postmortem distribution of drugs, interpretive postmortem toxicology, effects of embalming and decomposition on postmortem toxicological results and the effects of drugs on human performance.